In July, 1981, AFSCME members in San Jose, California, chose to take a stand to make sure women could earn the same pay their male counterparts made for the same work. Librarians. Clerical Workers. Janitors. More than 1,500 municipal workers decided that enough was enough, and dared to demand respect and justice. They decided they would strike. The workers knew they were worth it—and so did the city of San Jose. A city-initiated study found that jobs held by women were paid anywhere from 2 percent to 10 percent below average city pay scales for men. Even in the face of such evidence, the city did not address the issue. Nine days later, their strike won results. AFSCME negotiated a contract that included $1.5 million dedicated to wage increases for women-dominated jobs. 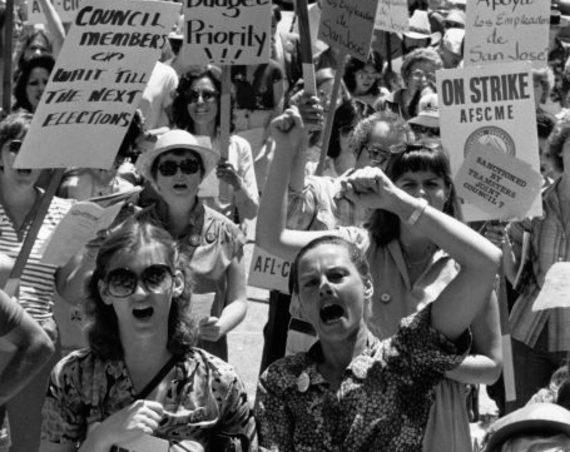 It was our country’s first successful strike to demand pay equity, and a proud moment in AFSCME’s long legacy of fighting for justice and equality. Women still deserve to earn equal pay. Their work is worth every dollar a man makes, but their earnings do not reflect that. Women make 79 cents for every dollar a white, non-Hispanic man makes, and the shortfall is even worse for women of color: Black women make 60 cents, and Latinas make 55 cents for every dollar a white, non-Hispanic male makes. The disparity is even more damaging, since women are more overrepresented in low-wage jobs, making up two-thirds of low-wage workers. This is wrong. Pay equity is the fair thing to do for women. It is also the right thing to do for families. Women comprise half the workforce, so in most families a woman either shares the economic lead or is the sole breadwinner. Every cent counts for working families. We have made progress since 1981, and AFSCME members have been at the forefront of the fight. For example, our members supported the Lilly Ledbetter Fair Pay Act. Signed into law seven years ago today by President Obama, the law gives women more tools to fight pay discrimination. The Ledbetter Act was a victory and a necessary step to help the cause, but seven years later, we need to do even more. We need to pass other laws at the federal, state and local levels to make sure that the protections of the Lilly Ledbetter Fair Pay Act exist in every workplace. That’s why AFSCME supports the actions of state legislators from more than 20 states who are joining a national effort called “Equal Pay Can’t Wait.” This campaign is moving legislation at the state level and raising awareness in our communities about the importance of equal pay for equal work. Ending this discrimination based on gender is also where unions come in. Union membership is one of best tools to shrink the wage gap. The best way for working people to get ahead is to work hard and band together with others through a union. This is how working men and women win better wages and benefits that can sustain their families, and lift up their communities by raising the floor for wages and benefits for working people, both union and nonunion. What’s more, a unionized workplace makes the basis for pay, recruitment and promotions a level playing field, regardless of gender and race lines. Unions hold even more benefits for women. Black women union members make 34 percent more than nonunion Black women, and Latina union members make 46 percent more than their nonunion counterparts. In addition, unions have smaller gender wage gaps. For union members, this gap is 40 percent smaller than the wage gap among nonunion workers. Public sector unions, like AFSCME, provide a surer path and promote greater equality for working women: Those who teach our kids, care for the sick and respond to the call in an emergency. And I am proud that women comprise nearly 60 percent of AFSCME members. Working women want what they have earned. So let’s finish the job. As long as the wage gap persists, we will fight. Women and working families are worth it.